All about the Stater Package when Land in Mandalay. We offer the following Starter Package (Your Arrival Day in Mandalay + Ava-Sagaing-Amarapura Tour as OPTION – 1 (or) Mingun – Mandalay tour as OPTION -2) to avoid suspicious circumstances and to conveniences at the beginning of your journey in Mandalay. This tour suit for the one who is coming to Mandalay for the first time and we named it “Starter Package.” When you land at Mandalay International Airport, welcome by our tour guide and he/she will help you to change the first Kyats (Myanmar Currency). Then explore Mandalay city area, the center of the culture and heritage. 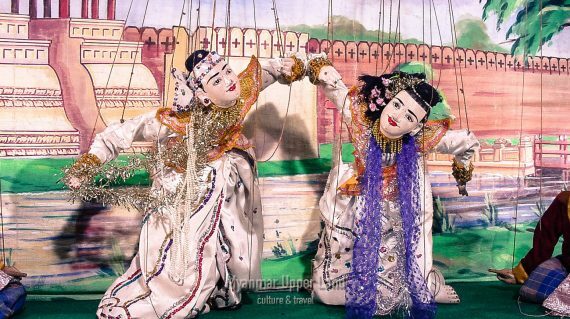 The next day you will visit Ava-Sagain (or) Mingun around Mandalay. On arrival to Mandalay airport, our tour guide will pick you up and introduce your trip detail. Then explore the Mandalay city. Mahamuni Buddha image covered with many layers of gold leaves and continued the visit to Myanmar handicraft workshops. Then go to the hotel and check in. After that visit Northern part of the city, Kuthodaw Pagoda ( the world’s biggest book), Golden monastery (famous for its intricate wood-carvings), a beautiful sunset for a panoramic view from the top of Mandalay hill. Then drive back to the hotel. Today you will visit three ancient cities Ava, Sagaing, and Amarapura around Mandalay. You will be picked up and transfer to Sagaing first to visit the highlight and then move to Ava jetty to take a ferry boat and horse cart ride for visiting Ava area. The last but not least visit U Bein bridge after a stop at silk weaving factory in Amarapura. 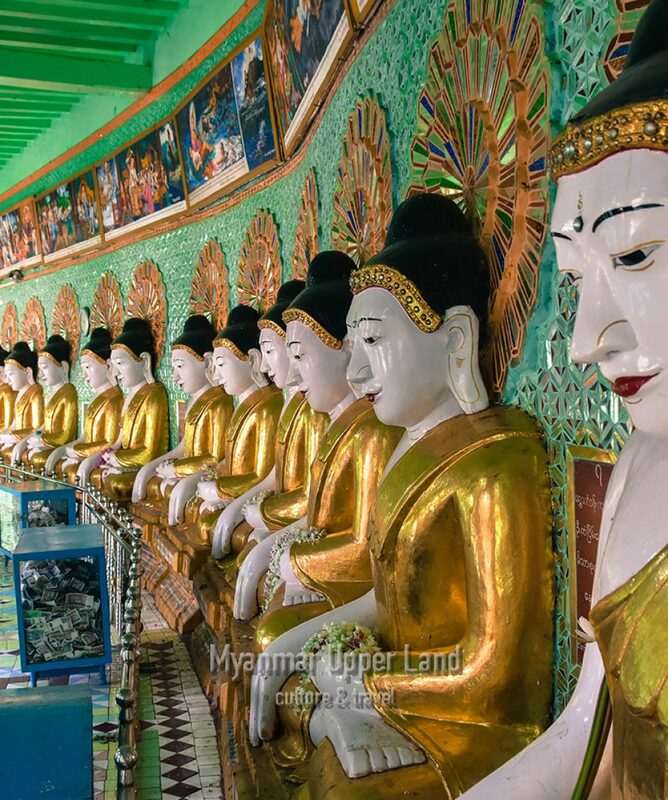 In Sagaing Swan OoPonnyashin pagoda is one of the interesting places to get the panoramic view from the hilltop and can learn the life of the local Buddhism who comes to worship. 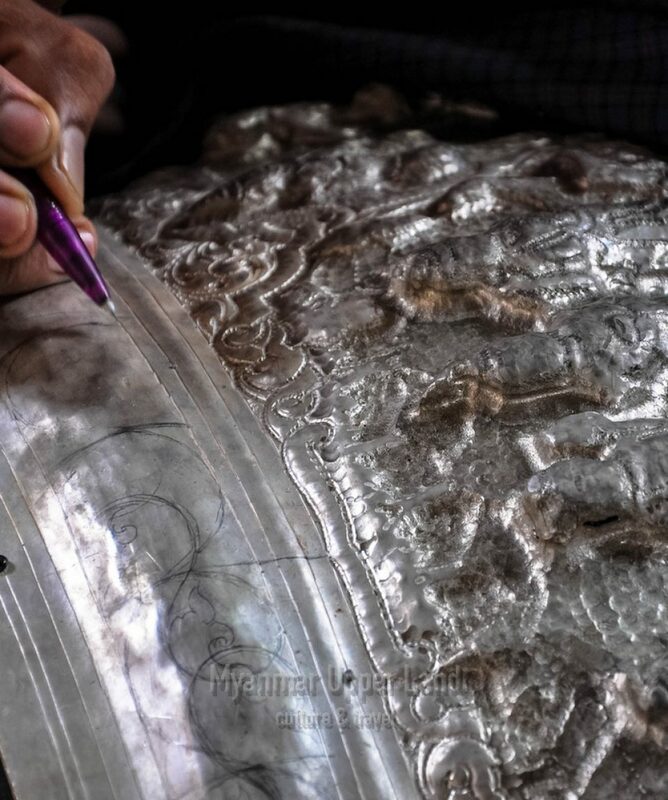 Silversmith is the famous product, and they produce silver wares in their traditional way in Sagaing. You can also even learn the daily life of the Buddhist Nuns at the Nunnery. In Ava, take a horse cart ride and Visit Bagaya teak wood monastery, Nan Myint Tower – 27 meter high and MahaAungMyaeBonzan monastery well known as Me Nu brick monastery. You can see local village life of Ava on a horse cart. 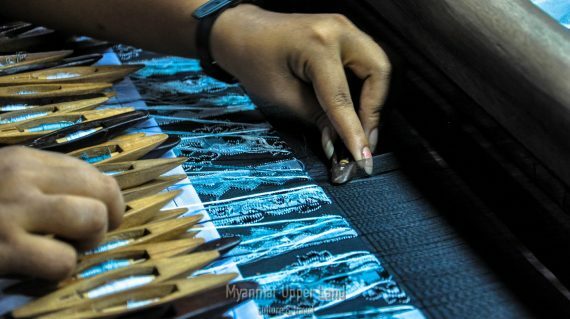 Then transfer to Amarapura where Myanmar traditional silk weaving factories are located and visit the shop. After that visit to U Bein bridge famous and charming, relaxing place in Amarapura. Sunset on the wooden bridge is memorable visit on this trip. Touring finished for today and back to the hotel. If you do not prefer ” Optional (1)” still you can choose ” Optional (2) ” for Day 2 . Morning, drive to the jetty to catch the ferry boat to Mingun and visit rural village and cultural heritage site. Then come back to Mandalay on a boat and continue to visit Mandalay. 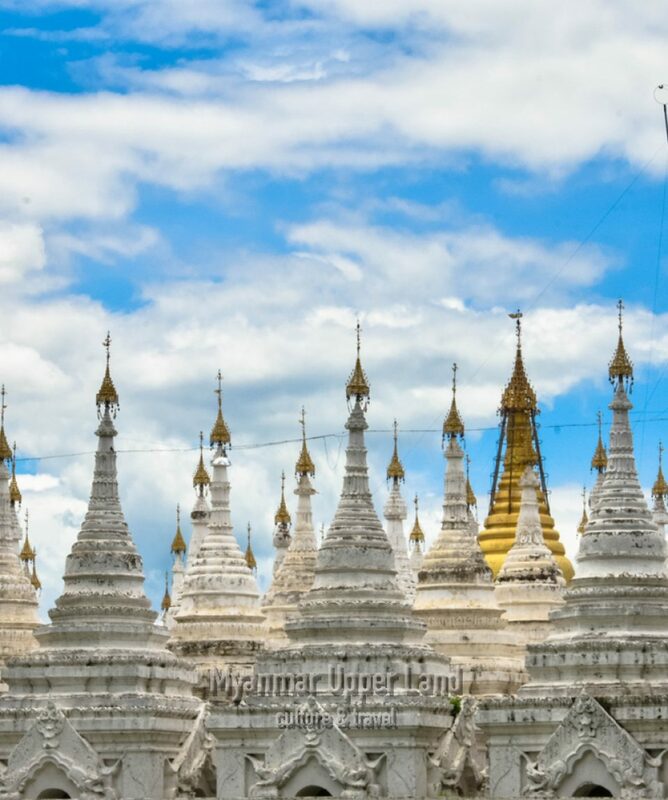 Visit Mingun, the rural area where ancient buildings of a pagoda and famous Mingun Bell (second largest bell in the world) and Mya Thein Tan Pagoda is uniquely shaped. Lunch is at the restaurant with local foods. After that continue the visit to the rest interesting places in Mandalay including school visit at Monastic education (if it is the school day), local market, ShweInnbin wooden monastery, Myanmar traditional bullock cart making and so on. This tour will end at the hotel in Mandalay after breakfast. If you want to continue or extend your trip please contact us and we will provide the best itinerary and price for you. But you may request for luxury or budget hotels we are happy to offer the update price for this tour. Please let us know in advance. We offer other travel related service such as domestic flight tickets, hotel bookings, Tour guide services, other transportation services and extension tour packages depend on your request. Please contact us at office@myanmarupperland.com. 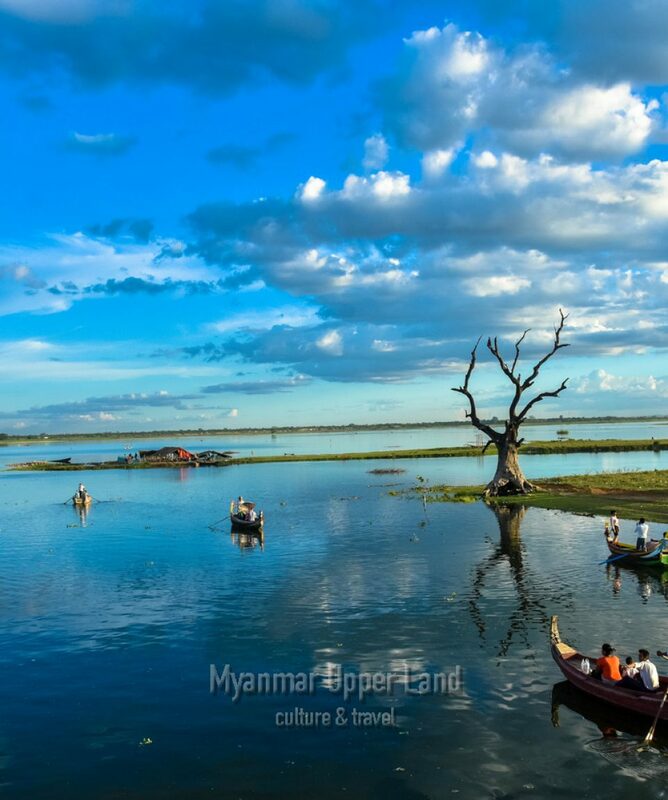 We recommend to continue visiting to Bagan, Inle and Yangon for your holiday.